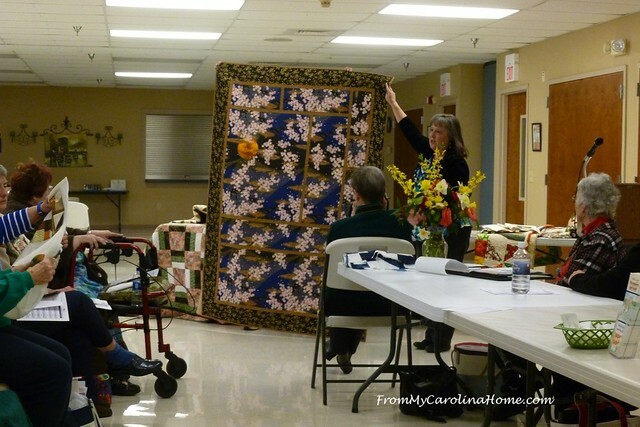 Speaking to quilt groups is one of the most fun things to do. 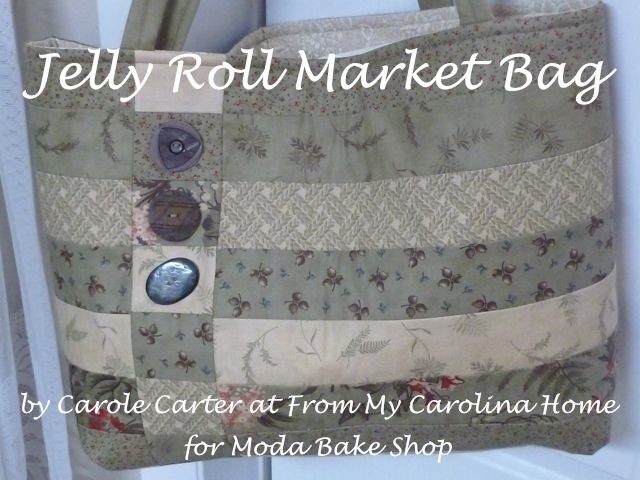 I get to meet new quilters, talk with other longarm owners, and have a great time. 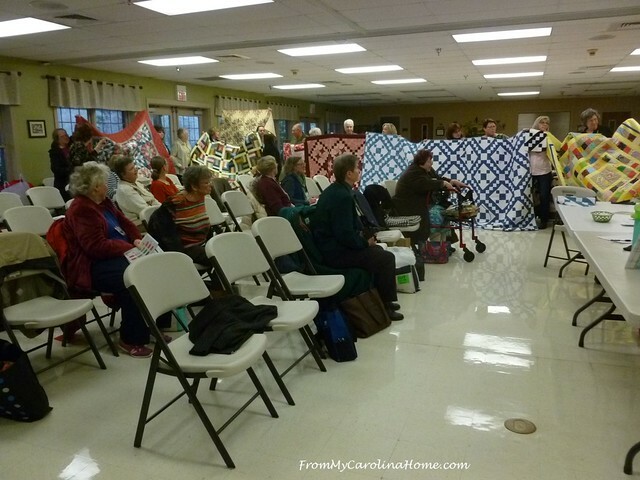 Last week I presented my program, Decisions Decisions, to the Ashe County Piecemakers Quilt Guild and I have to say that I was treated like royalty from the moment we arrived. 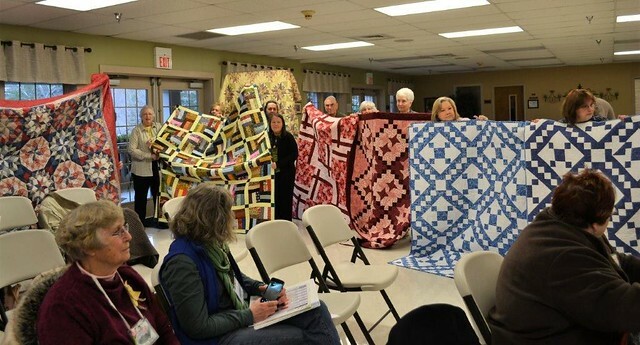 The Ashe County Piecemakers Quilt Guild was the first NC guild to take on the Carolina Hurricane Quilt Challenge, and they really came through! During the course of our talks, the contact person Kathy Carpenter, came up with the idea of having me as a guest speaker and picking up their hurricane quilts. What a fabulous idea! She invited DH and I to lunch before the meeting, and treated us at a local landmark in West Jefferson, NC called the Hotel Tavern. It is in the historic hotel building in the rural downtown area. It was built in order to provide services to the Virginia Creeper train that was in operation beginning in 1915, and running to 1977. 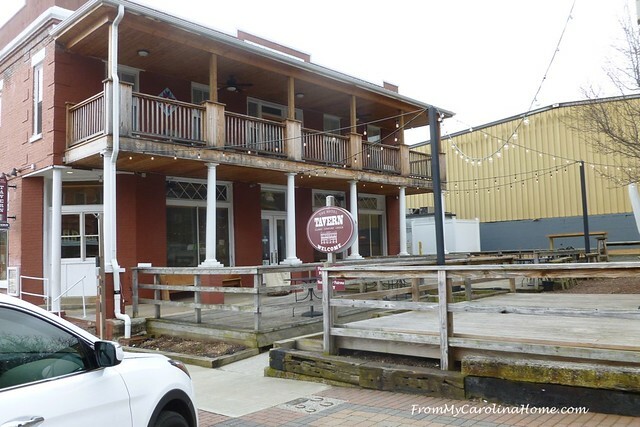 It was a wonderful place to have a meal, with the wooden floors, black walnut bar, and cozy atmosphere. The building is the second oldest in West Jefferson, and the walls are decorated with historic black and white photos of the town. With an eye to preservation, the current owners kept much of the original building intact. We ate and chatted for about an hour with several members of the guild, then did a short walking tour of the local sights. It was so much fun to get to know a few members one on one. 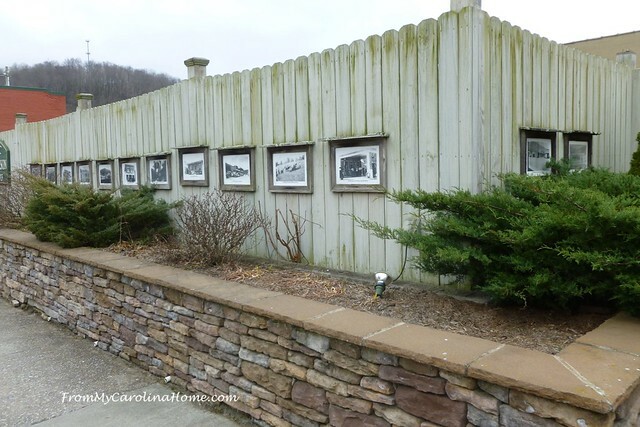 This fence hides an unsightly view, and is decorated with historic photos of the town. 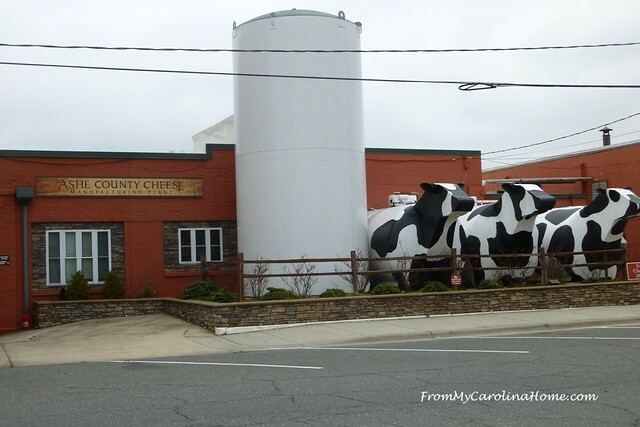 The county is known for two things, the Christmas tree farms and the local cheese factory. We definitely need to go back when we can for another visit to see all the art work and frescos, and do the Barn Quilts Trail in the county. 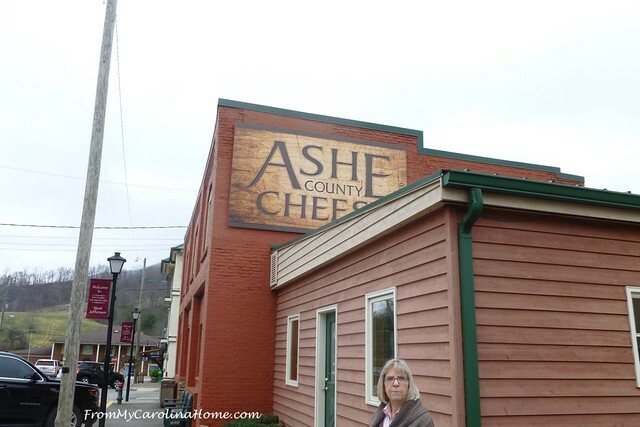 The Ashe County Cheese manufacturing plant was across the street from the retail store, and is the oldest cheese factory in NC. It has been there since 1930. Yes, we had to get some local cheese to go. Kathy had advised that we bring a cooler, and we did. 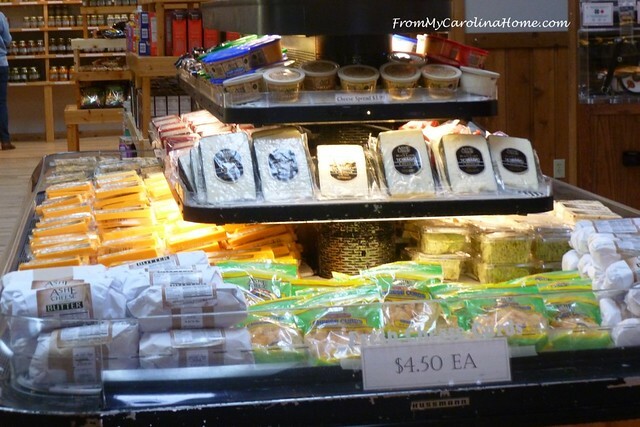 The retail shop has 20 varieties of original cheese in various types and flavors, homemade butter, fresh made fudge, local wines and honey. Then, it was on to the quilt guild for their meeting and program. 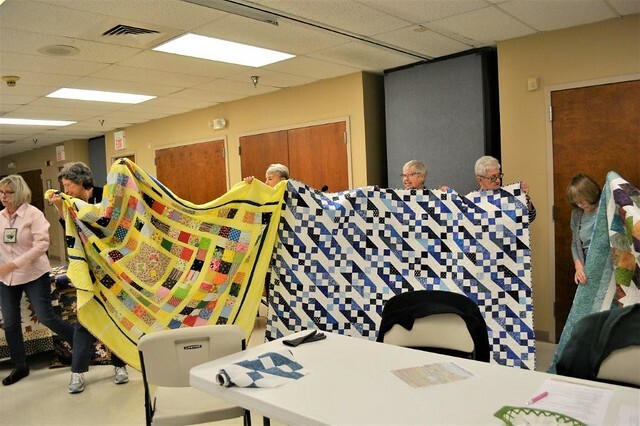 After a short business meeting, members showed the quilts that were made for the hurricane project. More than half of the members left their chairs to hold up group made quilts. I have to say I was blown away by the number of quilts donated. Plus there are several more in the works that will be taken to a drop point in the next couple of months. Fourteen quilts were loaded into the car at the end of the day. The challenge was to make five. What a generous and giving group! I’d love to be a member of this fun and friendly guild. 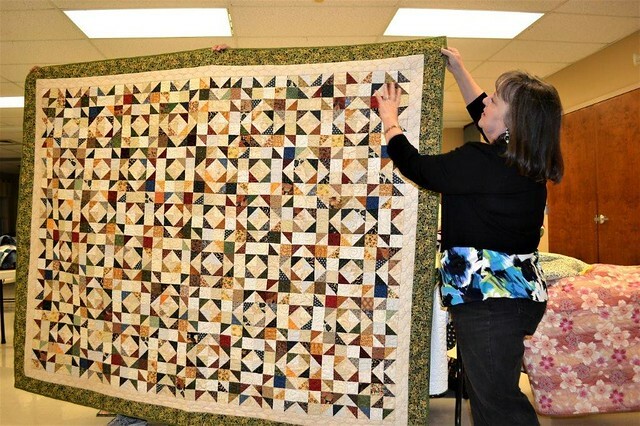 Kathy had members making Jacob’s Ladder blocks, and more quilts will be coming. After the show and tell, I spent just over an hour presenting my program, with lots of ideas on your choices after the top is done. I talk about threads and battings, quilting choices, technical accuracy tips, and several neat tricks I’ve learned over the years, with lots of things to pass around and handle. Quilters are a tactile group! I also talk about considerations when sending a top to a longarm quilter. The program concepts are applicable to those who quilt their own quilts too. 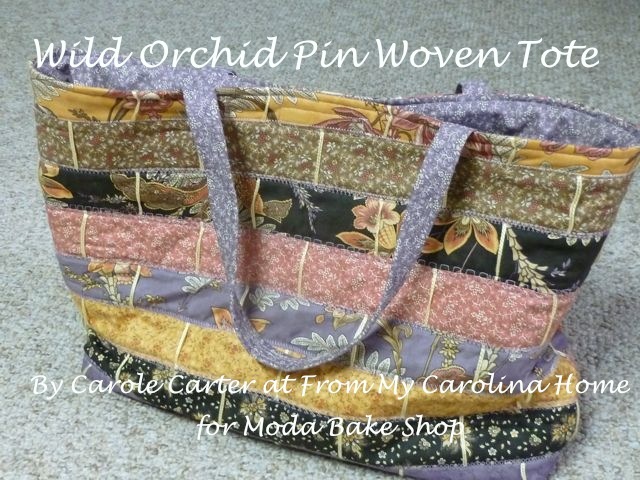 Part of the program is a trunk show of my quilts, most of my own designs. I use my quilts to illustrate the points in the program. 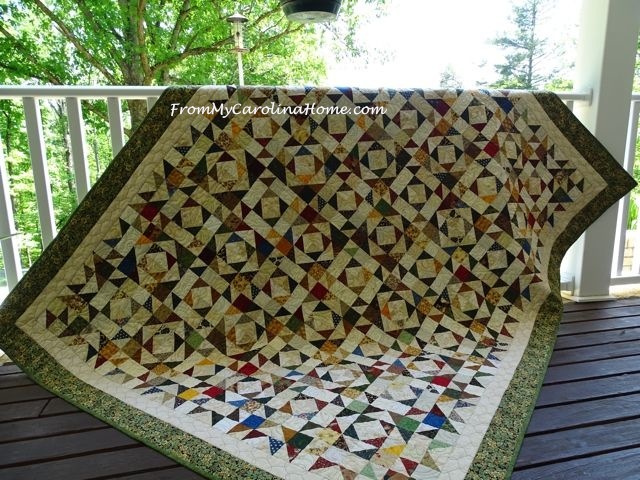 This is Scrap Dance Tango, originally a mystery quilt along on the blog. 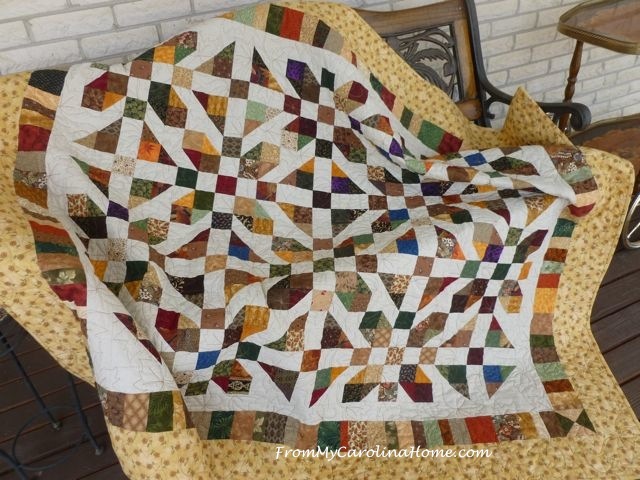 This year’s quilt along Scrap Dance Minuet is in progress, and you can catch up. Steps post once a month. 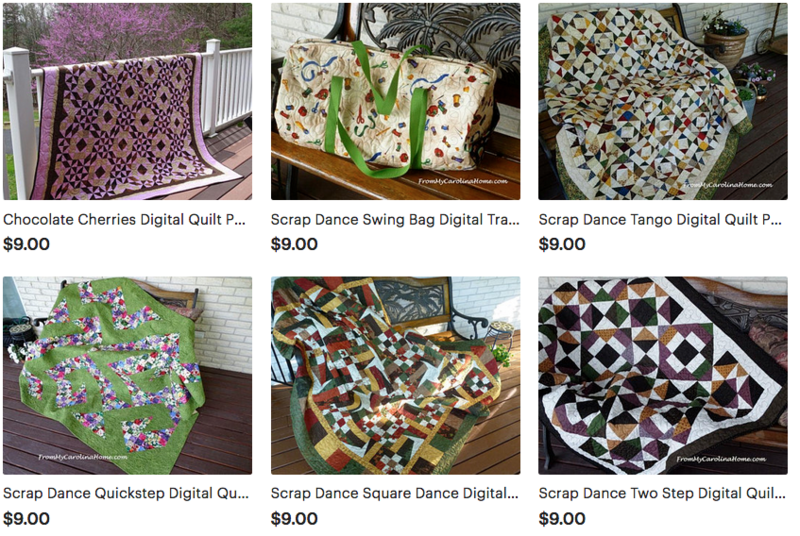 Scrap Dance patterns are available on my Patterns page, also on Etsy and Bluprint. After the program, I was thrilled with the number of quilters who came up to say how much they enjoyed the program, and ask more questions. For me, this was very gratifying, and I appreciate their thoughts and comments. Have you ever visited another quilt guild while traveling? Thanks to the wonderful vendors who provided door prizes for the group! Affiliate links for your shopping convenience. My favorite Aurifil Threads at Fat Quarter Shop and Aurifil Threads at Bluprint. Wonderful Hobbs Batting with wool, cotton, cotton-wool and silk samples. and Quilter’s Dream Green, 100% Recycled Plastic Batting, a fantastic way to help save the planet and create a market for recycled bottles. Participants were amazed at the softness of this batting. 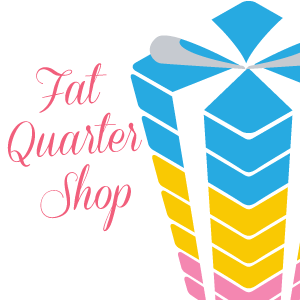 Check out today’s Flash Sale at Fat Quarter Shop! Great deals changing daily. You can keep your creativity going long after National Craft Month ends with Bluprint. Get the supplies you need and the kits you love — and save up to 60%. 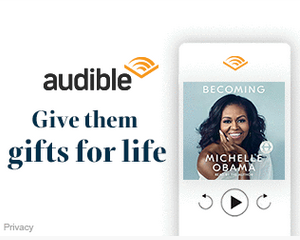 Offer ends 3/24/19. What a wonderful group with such big hearts! Fantastic event for all involved and such wonderful quilts. Quilters are so generous and thoughtful. Glad you had the opportunity to join this group for a special presentation. Very special Carole! Such a great picture of how we are all in this together!! And you completed the circle by spending time with these lovely generous quilters, giving yourself to them as they have given to the project so selflessly. Yes, makes my heart swell also!! Wow. What a great group! I have never been to a quilt guild, may have to put that on my to do list! What fun. And what an amazing quilt guild. 14 quilts will certainly help to provide much-needed smiles and quilty comfort to many impacted by the floods in the Carolinas. All the quilts are so beautiful. 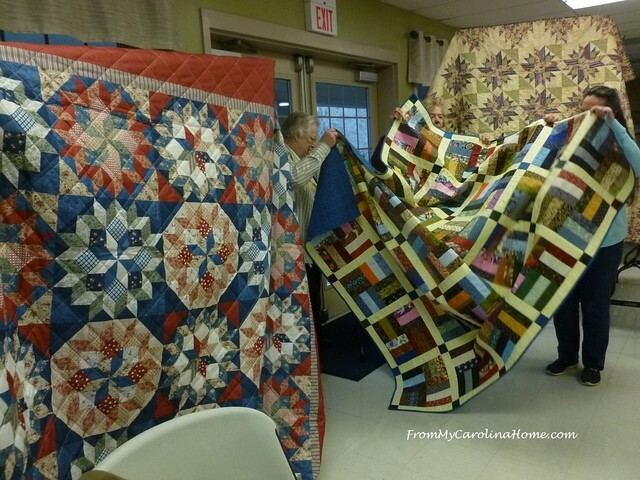 WOW — what fun and the quilts are beautiful! We enjoyed having you at our meeting. Enjoyed our conversations at Hotel Tavern. Hope you enjoyed your cheeses. What a wonderful day you had! It’s obvious the quilters enjoyed you. 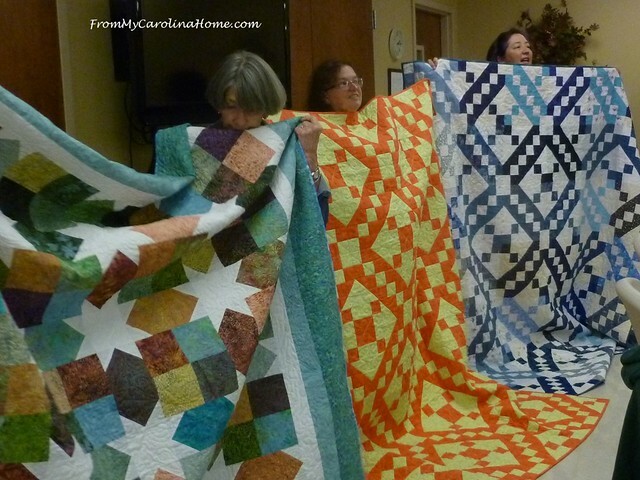 The quilts they made for the Carolina Hurricane Quilt Challenge are fabulous!! I love it when quilters make beautiful quilts to be given to others…taking the time to make beautiful patterns makes it feel less like a hurried charity quilt and more like a gift of love from the heart. These ladies generously shared their love and talents with those impacted by the hurricane. What a delightful post! 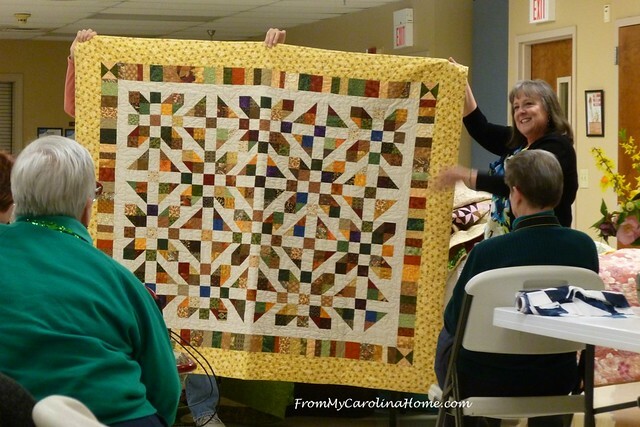 Cheese, butter, happy & generous quilters,….wow…… The quilts are really gorgeous. Thank you for sharing……and I am sure they all appreciated your presentation. It looks like you had a wonderful day. Lovely town and great people. Lovely range of quilts made by everyone. Well done with your presentation, too. What amazed me most was the quality of thought and materials put into the making of their quilts. Truly generous in both areas. 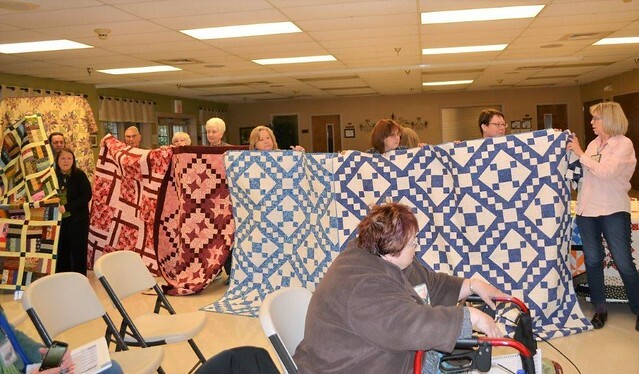 An amazing charitable group of quilters! Wow! What a great and generous response from what looks like a super guild! These are beautiful! 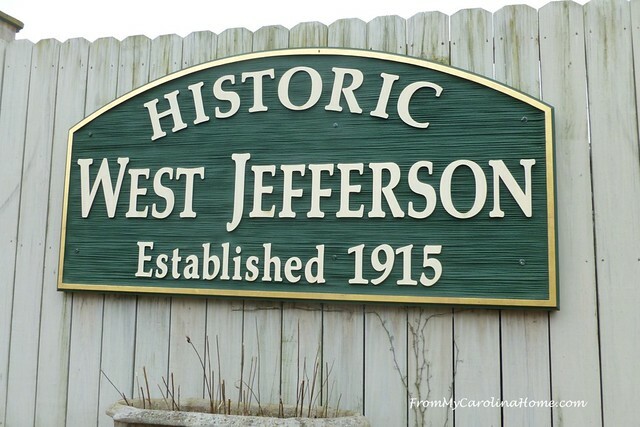 And it looks like you had a lovely time in West Jefferson. Your program looks great. I was pleased to see the original Scrap Dance in the photos!!! That’s still one of my all-time favorites.